3. DEHUMANIZATION: One group denies the humanity of the other group. Members of it are equated with animals, vermin, insects or diseases. Dehumanization overcomes the normal human revulsion against murder. At this stage, hate propaganda in print and on hate radios is used to vilify the victim group. Nazi ideology presented Jews as "poisonous parasites", as "vermin", "bacteria" and "bacilli". The film “The Eternal Jew” itself compared the Jews to "rats". The 1940 anti-Semitic propaganda movie "Jud Suess," called them "locusts". Hitler described Jews as a "disease", a force of disintegration, and as "parasite" within the body of the people: 6 millions were killed. But this rhetoric does not target the Jews only. In Cambodia, the Khmer Rouges used to call their victims "worms. ": nearly 2 millions were killed. In Rwanda, the Hutu militia called them "cockroaches": 1 million were killed. "The genocide occurred nearly 15 years ago. In April the airplane of the Rwandan president Habyarimana and the Burundian president was shot down over Kigali. As a result the violence of the Hutu regime against tutsies and oppositional hutus began. RPF (tutsies) launches a major offensive from Uganda. The systematic massacre began at the same time. Within 100 days around 800,000 Tutsis and moderate Hutus were killed. Hutu militias then fled to Zaire, taking with them around 2 million Hutu refugees. For years the hutus continued their guerilla warfare against the tutsies using civilian hutus as shields. Some time after the organization, under the leadership of Lyndon LaRouche, started a campaign to blame the genocide entirely on RPF and the tutsies. " From The friends of Lyndon LaRouche in Africa: dictators, lunatics and genocidialists. (APRIL 22, 2009) at american-lycurgus.blogspot.co.uk, written by a former member of the LaRouchemovement (ICLC) in Europe. "In the first article in this series I showed that the LaRouchecult in its coverage of the genocide in Rwanda, has DE FACTO defended the genocidialists from 1994 onwards. The tutsies of the RPF are blamed by the cult for the genocide and NOTHING has ever been written (to my knowledge) showing anything evil that the hutu government and its militias did. I was fooled by this, while I was a member, as where many others. For 10 years I bought the propaganda of the cult that the tutsies were to blame for all evil!" From WANTED, for crimes against the humanity! 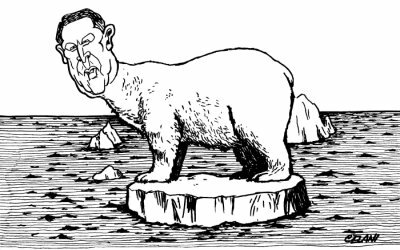 (part two in a series on Lyndon LaRouche and Africa) at american-lycurgus.blogspot.co.uk, written by a former member of the LaRouchemovement (ICLC) in Europe. "The 1994 Rwanda genocide is but the latest instance of the WWF in action. How? Since 1990 the WWF have been managing a 'gorilla protection program' in Gorilla Park in Uganda right on the Rwanda/Zaire border as well as Volcans Park on the Rwanda side of the border and in Zaire's Virunga Park. Along with Akagera Park in Rwanda along the Kenya and Ugandan border. All these parks have served as training camps and arms depots for the invading rebels who were in reality, soldiers and officers in the Ugandan army of British puppet Yoweri Museveni. The entire genocide had nothing to do with tribal or civil warfare but a British-orchestrated assasination and invasion program"
From "The Coming Fall of The House of Windsor", The New Federalist, January 9, 1995, By Jeffrey Steinberg. "Who had an interest in committing that crime in order to provoke genocide? The information I have shows that Mr. Kagame, with a group of Tutsis that surrounded him, was the organizer of this attack. They are the ones who profitted from that crime..."
More at PROPAGANDA AND PRACTICE (Rwandan Genocide). "We also include as varieties of this general species-classification, the ancient Mesopotamian culture and the Siva current in India's culture, the Egypt-Hellenistic cults of Isis, Osiris, and Horus, and so forth and so on. Comparing Jews to pigs is not accidental and is part of a long history of antisemitism. Hitler recognized the potency of the language and imagery of disgust. He tapped into a rich vein of antisemitism running back throughout German history and folklore to the 14th century. German folk stories identified Jews with pigs. More specifically, Jewish people were depicted, in paintings, stories and carvings on churches, as suckling from pigs or eating pigs' faeces. In King Ferdinand and Queen Isabella's Spain, the new Inquisition was to examine the genuineness of Jewish conversos (recent converts to Christianity) and marranos (meaning pig) who were suspect of practicing Judaism in secret. Picture on the left: cover of Vom Schem Hamphoras und vom Geschlecht Christi (Of the Unknowable Name and the Generations of Christ)' written by Martin Luther in 1543, several months after publishing his infamous antisemitic book On the Jews and Their Lies. Picture on the left: a 1973 anti-Black leader pamphlet by LaRouche, depicting him as a HYENA. The German for "Locust" is "Heuschrecke". The "Heuschrecke" was a Nazi prototype self-propelled gun and "Weapon carrier" developed by Krupp-Gruson between 1943 and 1944. Calling "capitalist predators" as "locusts" started in Germany in 2005 and because of its use by the Nazis it created an outrage. 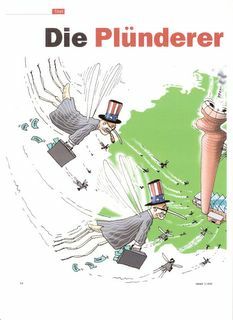 Indeed, Franz Muentefering, then chairman of the German Socialist party, compared certain foreign investors to these damaging insects and the weekly Stern listed seven "locust firms"; some were recognizably Jewish by their names. When historian Michael Wolffsohn pointed out the similarity to Nazi language, he was severely attacked by several prominent Socialists (7). In the Nazi propaganda movie JUD SÜSS, Jews were depicted as "locusts" (6). In 1996, racist leader Farrakhan called Jews as "locusts" (5) at the same time LaRouche (via Reverend Bevel) was in contact with Farrakhan's Nation of Islam. A 2006 Tehran exhibition of more than 200 satirical cartoons about the Holocaust ("Ho Locust"). From "1932, A True History of the United States" (LPAC), Phil Rubinstein. 1. "Dealing with the Russians' decisive cultural inferiority", Lyndon H. LaRouche, Jr., EIR, October 3, 1986. 2. "The Case of Walter Lippmann" (1977), p144.